Did you know that many corporations offer charitable matching gift programs? In these programs, corporations match volunteer hours or the dollar amount of employee donations to approved organizations, including to NYOS Charter School! The following businesses currently offer charitable matching gift programs that support NYOS Charter School’s Champion Program. 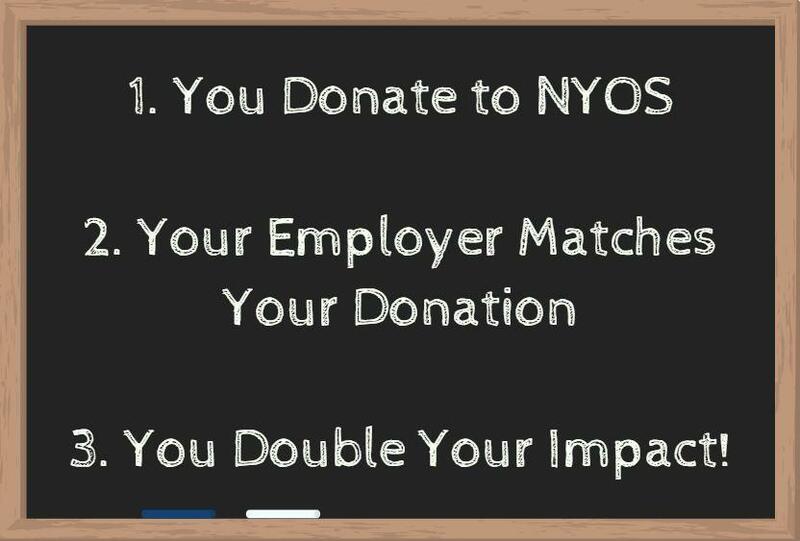 Just follow the step-by-step instructions below and double your impact to NYOS as a Champion Donor! For many of these corporations, NYOS is already verified within the employee donation portal. For others, you will just need to submit a request via a matching gift form. Once eligibility is confirmed, NYOS will receive the matching gift. If you don't currently see your employer listed, and you know that they offer a charitable matching gift program, let us know! To share more about your employer, or if you have any questions, please contact Community Outreach Specialist Amy Elms at aelms@nyos.org. 3M provides a 1:1 match, up to $500, for all donations made to qualifying nonprofit organizations through their employee portal. Just go here and enter your employee login information. You will then be directed to CyberGrants, 3M’s authorized matching gifts provider. 3M will also match volunteer hours, up to $500, for staff who volunteer 25+ hours over the course of the calendar year. To learn more about 3M’s Volunteer Match go here and follow the step-by-step instructions! Aetna’s Personal Donations Program matches up to $5,000 in donations per individual, per calendar year to qualifying nonprofits. Additionally, Aetna’s Volunteer Grants Program provides a grant of $300 to qualifying nonprofits where an Aetna staff member has volunteered at least 30 hours within a calendar year. Just go here, enter your employee login information, and fill out the “Matching Grant Request." Both part-time and full-time staff are eligible to participate in the American Express Gift Matching Program. Just login to your employee account here and select from a list of participating nonprofits. Any donations that are registered within the portal (minimum of $25, maximum of $8,000) will then be matched. Additionally, American Express matches volunteer hours, up to $1,000 annually, for staff who have volunteered with an organization for at least 50 hours over the course of a year. Apple matches monetary donations made to qualifying nonprofits up to $10,000 per calendar year. Additionally, Apple donates the equivalent of $25 to qualifying nonrprofit organizations for each hour that an Apple employee volunteers with an organization. To have your gift matched, just go here and login to Apple’s authorized matching gift provider, Benevity, using your employee login information. The Applied Materials Foundation matches employee contributions up to $2,000 per employee, per calendar year. To donate, login to your employee account here and access the “GivingStation” by typing “giving” into the intranet browser. Additionally, Applied Materials provides grants of up to $100 per quarter (up to $400 a year) to organizations where employees have volunteered at least 10 hours per calendar year. Applied Materials employees can submit a matching gift requests for volunteer hours here. AT&T supports participating nonprofit organizations through their Cause Cards Program. Cause Cards are grants from the AT&T Foundation given to organizations upon an employee’s request. Cause Cards range from $25 to $250 and requests can be made through AT&T’s authorized provider, YourCause, by going here and using your employee login information. AXA Financial’s Matching Gift Program matches AXA employee gifts that are a minimum of $50 and a maximum of $2,000 per employee, per calendar year. To submit a matching gift request, visit AXA’s CyberGrants portal here and entering your employee login information. The Bank of America Charitable Foundation Matching Gifts Program matches employee donations that are a minimum of $25 and a maximum of $5,000 per employee, per calendar year. Just visit BOA’s Cybergrants portal here and enter your employee login information. BOA also offers a Volunteer Grant Program for employees and retirees. 50 volunteer hours are turned into a $250 grant and 100 volunteer hours are turned into a $500 grant. To submit volunteer hours to be matched go here. CIGNA provides an employee matching gift program through their company intranet. Just login to CIGNA's intranet and search for “matching gifts.” Additionally, when CIGNA employees volunteer with an organization for at least 20 hours a year, CIGNA will provide a $200 grant to the organization when a Volunteer Grant Request is submitted through the company intranet. Citgo offers an employee matching gift program for individuals who submit a matching gift request. Just go here and login to Citgo’s intranet to submit the request electronically. Costco provides a corporate matching gift program to full-time employees who donate a minimum of $25 and a maximum of $10,000 per individual, per year. Employees can donate to participating nonprofits by logging in to Costco’s intranet and searching for “matching gifts” to access a matching gift form. Dell matches donations made through the company’s giving portal that are a minimum of $10 and a maximum of $10,000, per employee, per calendar year. Donations can be made through Dell’s authorized provider, YourCause, by going here and logging in using your employee login information. Dell also matches donations made by employee spouses if the donation is recorded as a joint donation. Additionally, Dell matches employee volunteer hours recorded within Dell’s Community Service Program for individuals who volunteer at least 10 hours per calendar year (10 hours will convert to a $150 donation). Deloitte’s Workplace Giving Program matches employee gifts that are a minimum of $50 and a maximum of $7,500 per employee, per year. Employees can choose to have funds raised for a participating nonprofit through direct payroll deductions. Additionally, employees can go to Deloitte’s authorized provider, Benevity, and submit a matching gift request here. Eaton Corporation provides a corporate matching gift program for employees who donate a minimum of $25 and a maximum of $5,000 per employee, per calendar year. Employees just need to login to Eaton’s intranet and the search for “matching gifts” to download a matching gift request form. Expedia provides a corporate matching gift program for both part-time and full-time employees who have been with Expedia for at least three months. Additionally, gifts will be matched that are a minimum of $25 and a maximum of $4,000. To have your donation matched, employees can go to Expedia's authorized provider, Benevity and submit a matching gift request here. Expedia employees can submit matching gift requests for donations made at any point within the last 12 months. Freeport-McMoran Copper & Gold (FCX) provides corporate matching for employees who donate a minimum of $25 and a maximum of $40,000 per employee, per calendar year. Additionally, the first $1,000 in donations that are made by an employee will be triple matched. To have your donation matched, go here and submit a donation request form through FCX’s authorized provider, Cybergrants. FCX also provides volunteer matching grants. 25 volunteer hours are converted into a $250 grant and 50 volunteer hours are converted into a $500 grant when individuals submit a volunteer grant request here. Grainger matches both employee and retiree contributions made to participating nonprofit organizations. Employees can donate a minimum of $25 and a maximum of $2,500 to be matched, per employee, per calendar year. To have your donations matched, go here and submit your donation electronically through Grainger’s authorized provider, CyberGrants. HP employees can participate in a corporate matching program for individuals who donate a minimum of $25 and a maximum of $1,000, per employee, per calendar year. To have your donation matched, go here and login using your employee information to submit your donation through HP’s authorized provider, Benevity. Home Depot provides a matching gift program for employees who donate a minimum of $25 and a maximum of $3,000 to participating nonprofit organizations, per employee, per year. Just go here and login using your Home Depot employee information to register your matching gift request. IBM provides a corporate matching gift program to employees, retirees, and board members who donate a minimum of $25 and a maximum of $5,000, per employee, per calendar year. Just go here and enter your login information to submit a matching gift request. Additionally, IBM Community Grants support employees and retirees who volunteer with area nonprofits. Team Grants of up to $7,500 are provided for groups of IBM employees who volunteer together with area schools. Individual employees who volunteer at least 8 hours a month for 5 months are also eligible to submit a donation of up to $1,000 or a technology grant of up to $3,5000 for participating nonprofits. These hours can be logged electronically within IBM’s "On Demand Community" or can be submitted via a volunteer request here. Intel provides a Matching Gift Program for employees and retirees who donate a minimum of $25 and a maximum of $10,000 to participating nonprofit organizations per employee, per calendar year. To have your donation matched by Intel, go here and login using your employee username and password to submit your donation electronically through Intel's authorized provider, Benevity. Intel also offers a Volunteer Grant Program for employees in which the Intel Foundation will donate $10 per volunteer hour when a minimum of 20 volunteer hours are accrued. Just login to Intel’s intranet and search for “Intel Involved Matching Grant” to access Intel’s Volunteer Grant Portal. McGraw-Hill offers a “Community Partners” matching gift program for all employees and retirees in which donations are matched (minimum of $25 and maximum of $3,000) per employee, per calendar year. To have your donation matched, login to McGraw-Hill’s intranet and submit a matching gift request here. Employees and retirees can also have volunteer hours matched, with 50 hours of volunteer services converting to a $500 grant. Additionally, volunteer grants of up to $5,000 can be given to participating nonprofits when teams of three or more McGraw-Hill employees/retirees volunteer together. Just logon to McGraw-Hill’s intranet and submit your volunteer grant request here. Microsoft offers a corporate matching gift program for all employees, both part-time and full-time, who donate a minimum of $1 and a maximum of $15,000, per employee, per calendar year. To have your donation matched, just login here using your employee login information through Microsoft’s authorized provider, Benevity. Additionally, Microsoft employees can have their volunteer hours converted to monetary donations for registered nonprofit organizations. There is no minimum number of volunteer hours required and donations are converted to $25 per volunteer hour. Login here to submit a volunteer grant request electronically. National Instruments provides a corporate matching gift program for employees in which donations can be matched (minimum of $25, maximum of $1,000) per employee, per calendar year. Just go here and login to your NI account to donate through NI’s authorized provider, YourCause. Northern Trust employees can take part in a corporate matching gift program in which donations are matched at a minimum of $25 and a maximum of $2,000, per employee, per calendar year. Just login here using your employee login information to submit a matching gift request electronically. Additionally, Northern Trust employees who have volunteered at least 60 hours a year can have volunteer hours converted to a $250 grant to be given to a participating nonprofit. Logon to Northern Trust’s intranet and search for “volunteer grants” to learn more! Oracle provides a corporate matching gift program in which employees can donate a minimum of $25 and a maximum of $300 per employee, per calendar year. Just go here and login to your Oracle account to donate through Oracle’s authorized employer, Benevity. You must submit this matching gift request within six months of donating to an organization. Pearson provides a corporate matching gift program for both part-time and full-time employees who want to make a donation to an educated-related organization, including K-12 schools. Employees can donate a minimum of $25 and a maximum of $500, per employee, per calendar year. Just got here and login to submit a matching gift request through Pearson's authorized provider, Benevity. PPG provides a matching gift program for both employees and retirees who volunteer at least 10 hours with participatings. PPG will convert these hours to $500 for standard employees or to $1,000 for PPG employees who are on a nonprofit board. You can also submit a sponsorship request to PPG for up to $1,000 to be used towards a specific project for participating nonprofits. Just go here to log your volunteer hours and submit a volunteer grant request electronically. Progressive provides a corporate matching gift program for both part-time and full-time employees who donate a minimum of $20 and a maximum of $3,000 per employee, per calendar year. Just go here and login to your employee account to submit a matching gift request through Progressive’s authorized provider, CyberGrants. PulteGroup provides corporate matching gift opportunities for employees. Just go here and login to your employee account to submit a matching gift request through PulteGroup's authorized provider, Cybergrants. Red Hat offers a corporate matching gift program to employees who donate a minimum of $50 and a maximum of $750 per employee, per calendar year. Just login here using your employee login information to donate through Red Hat’s authorized provider, YourCause. Both Walmart and Sam’s Club offer a volunteer matching gift program for individuals who volunteer 25 to 50 hours a year with participating nonprofits. Volunteer hours can then be converted to a $250 grant (per 25 hours) when submitted through Sam’s Club/Walmart’s intranet and going to the following: Wire, Walmart, Walmart Foundation, Volunteerism, and Volunteerism Always Pays. Samsung offers a corporate matching gift program to employees who donate a minimum of $25 and a maximum of $2,500 per employee, per calendar year. Just go here and login using your employee account information to donate through Samsung’s authorized provider, Benevity. Silicon Labs’ philanthropy program provides financial, volunteer, and in-kind support to participating nonprofit organizations that promote STEM education. Employees can donate up to $2,000 to be matched through the Silicon Labs Match Program, per employee, per calendar year. Contact Silicon Labs’ Culture & Development Specialist to learn more! The State Farm Companies Foundation provides a matching gift opportunity to all employees who donate a minimum of $25 and a maximum of $1,500 per employee, per calendar year. Just go here and login to have your donation matched by State Farm’s authorized provider, Benevity. Telus provides a corporate matching gift program for part-time employees, full-time employees, and retirees who donate a minimum of $25 and a maximum of $10,000 per individual, per calendar year. Additionally, Telus provides volunteer matching for employees who volunteer 50 to 200 hours annually, converting the hours into a $200 to $500 grant. To donate or to submit volunteer hours, login here using Telus International’s authorized provider, Benevity. Texas Instruments offers a matching gift program for full-time employees, part-time employees, and retirees who donate a minimum of $50 and a maximum of $10,000 per individual, per calendar year. For individuals who volunteer at least 20 hours a year, Texas Instruments who convert volunteer hours into a grant, up to $1,000 annually. To donate or to submit a volunteer match request, login here using Texas Instrument’s authorized provider, CyberGrants. Time Warner/Spectrum provides a matching gift program to employees who donate a minimum of $25 and a maximum of $1,000 per employee, per calendar year. Additionally, employees who volunteer at least 30 hours annually can have their volunteer hours converted into a $500 grant. To donate or to submit a volunteer grant request, login here using Time Warner/Spectrum's authorized provider, Benevity. Verizon provides a corporate matching gift program for part-time employees, full-time employees, and retirees who donate a minimum of $25 and a maximum of $5,000, per individual, per calendar year. Additionally, for Verizon employees or retirees who volunteer at least 50 hours per calendar year, these hours can be converted to a $750 grant. To submit a donation or a volunteer match request, go here and login using your employee information. VMWare offers a corporate matching program for employees who donate a minimum of $31 and a maximum of $3,141 per employee, per calendar year. To submit a donation match request, go here and login using your employee information. Wells Fargo offers a corporate matching gift program to both full-time and part-time employees who donate a minimum of $25 and a maximum of $5,000 per employee, per calendar year. Additionally, Wells Fargo provides volunteer grant requests to organizations where employees volunteer regularly (there are no minimum hours). To donate, login to Wells Fargo’s intranet here and submit a matching gift request. To submit a volunter request, login here.